In my nearly 60 years of building model aircraft, cars, boats, and rockets, working on cars, maintaining houses and yards, working with electrical and electronic apparati[sic], and many other activities, I have inhaled and had skin contact with many types of chemicals (all legal, BTW). You probably have, too, if you are near my age. At least by the 1960s the public was becoming aware of the dangers of exposure to common household and workplace substances, but viewing older pictures and films showing people working with no eye, ear, or skin protection explains the all-too-common common sight of crippled and disfigured people back in the days. 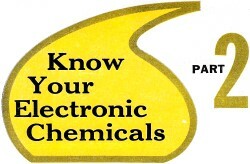 In the early and mid 1970s I worked regularly with methyl ethyl ketone (MEK) until it was removed due to being labeled as a suspected carcinogen. The stuff is an excellent degreaser and cleaner-offer of solder flux. It has since been put back on store shelves; I have a can of it bought at Lowes. While visiting in the 1980s a manufacturer of huge electrical substation transformers one time, the 80-something-year-old owner told me about how many times over the decades before the ban he used to lay with his arms submerged in PCB (polychlorinated biphenyl) insulating/cooling oil while making adjustments to core winding connections, and doubted the hype of danger about the compound. Properties of cements, lubricants, insulators, miscellaneous chemicals. Choosing the right one. In the preceding article describing cleaners and solvents and their applications, the point was made that the choice of the right chemical for each job was highly important. This principle applies with equal force to cements and lubricants, of which there is considerable variety. The advantages and limitations of each and how they should be used are important to know, especially with respect to the several types widely available at local parts distributors. In addition, the user often has to be aware of certain preparatory steps that are required before certain cements may be used successfully. Practically every type of glue or cement is intended to work on either chemical or mechanical principles. Special-purpose cements usually form a chemical union with the materials they are supposed to hold together. General-purpose cements hold materials together by adhesion due to surface tension, capillary action, vacuum (suction), or some other mechanical property. One precaution will become apparent from a brief consideration of the first principle of cementing. When the cement itself is intended to react chemically with the material to be glued, accidental application to good parts of the material can result in spots or stains that may be permanent. If, for example, we spill a few drops of polystyrene cement on a styrene cabinet, this will soften and wrinkle the surface, in a few seconds, beyond repair. Cements intended for mechanical adhesion can also cause spots, especially if their solvents affect such substances as wood finishes. A good example is the use of "Pliobond" for gluing fabric to wood. The "Pliobond" solvent is methyl ethyl ketone, which will attack most wood finishes but will not affect such plastics as Bakelite. A notion as to the wide range of available preparations may be derived from the group shown here, a relatively small sampling from a single manufacturer's line. From left to right we have one of several types of cement, a lubricating oil, soldering flux, a solvent or remover for some types of finishes and plastics, and a preparation for dressing dial and drive cords. 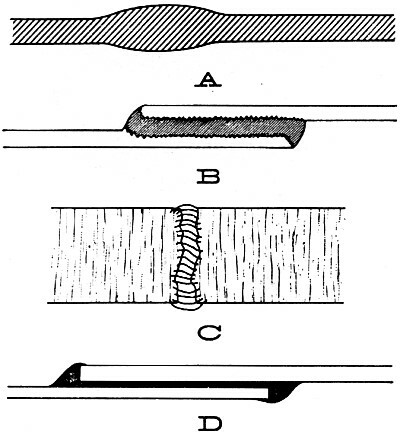 In the cross-section drawings of Fig. 1, we see how the basic glues work. First (Fig. 1A) is the case of similar plastics glued by the same material. This results in a continuous· piece of one material. In fact, the repaired spot may be stronger than the rest of the plastic, since this particular point is likely to be thicker than the rest of the material. When two different plastics or other substances are cemented by a third material, the adhesion on each side may be due to the action of a solvent that attacks both materials, as in Fig. 1B. Capillary-action glues for holding porous materials and "vacuum" (suction) adhesives for joining smooth surfaces are shown respectively in Figs. 1C and D. In either case the cement must harden to form a strong and tough joint. 1. Clean surfaces well. 2. Prepare in advance clamps, a vise, or another method for holding the work while cement dries. 3. Keep a clean rag at hand. Use old newspaper or other waste as a base for the job so that dripping cement will not ruin anything. 4. Apply cement sparingly and only to the surfaces to be cemented. 5. Fix cemented pieces into position quickly and clean off excess cement at once. 6. To speed drying, an infrared lamp, a fan, or both may be used, but be careful not to heat plastics too much. Those cements that form a chemical bond are usually used to glue specific plastic materials together. They are very effective and, if properly used, the new bond can be stronger than the original material. It is important that the right material and the corresponding cement be used, since otherwise the desired chemical fusion will not take place. For example, it would be futile to cement two pieces of Lucite (an acrylic) with vinyl cement. The latter adhesive, however, will practically weld vinyl pieces together so that they are permanently joined. In the mechanical or physical type of cementing, surface roughness and porosity are the most important factors. If we want to glue a piece of vinyl to an acrylic, then neither vinyl nor acrylic cement should be used, but a plastic "all-purpose" cement, or even a rubber-base glue, could work. The catch here is that the bond will never be as strong as if two similar plastics had been joined with their common-base glue. In other words, we can glue rubber strips to Lucite, but they will not hold as well as if a Plexiglas or other acrylic had been glued with acrylic cement to the Lucite. 1. Acrylic (Lucite, Plexiglas). 2. Epoxy (various laminates including fiberglass, printed-wiring board coatings, sockets). 3. Nitrocellulose (clear plastics such as celluloid). 4. Phenolic (Bakelite, as used in knobs, coil forms, insulators). 5. Polyethylene (plastic tubing, cabinet coverings). 6. Styrene (polystyrene, used in coil forms, cabinets). 7. Vinyl (tubing, cabinet coverings) . Phenolics can take quite a bit of heat, but they start to give off a very characteristic odor long before they burn. Anyone who has ever smelled a composition resistor in the early stages of overheating should be able to recognize phenolic ever after. The odors of acrylic, styrene, and vinyl are also quite distinctive when a hot soldering iron is applied to an inconspicuous corner of the material. Epoxy is hardly affected by the soldering-iron test and also does not react very much to any of the conventional solvents. Nitrocellulose has a "celluloid" odor even without any heat, and is easily attacked by acetone and similar solvents. Fig. 1 - Most glues bond the surfaces they bring together by one of four basic types of holding action. Illustrated here, they are explained in the text. Despite the many plastics for which cements are readily available, there are a few that cannot very well be glued together. Nylon, Teflon, silicon rubber and similar "special" materials will defy most conventional chemical and physical glues. There are special cements designed for some of these materials, but they are generally available direct from the manufacturers only, and usually in large quantities only. Some of the plastic cements also have excellent insulating properties: accordingly many of these are prepared and sold as preparations designed specifically for that purpose. Polystyrene, also often known as "Polydope," "Q" dope, or coil dope, is excellent as a high-frequency, low-loss insulator. It is used on coils to hold the wires in place and, at the same time, serves as insulation between wires. Other plastic preparations, such as krylon, an acrylic, can be sprayed into high-voltage areas to coat critical points and improve the insulation. Still another insulating application is the coating of antenna terminals to keep out moisture. The cements that depend on mechanical adhesion are also widely used in electronics: some of them are essentially plastics as well. As a matter of fact, nitrocellulose glue is more popularly known as "service cement," because it is used for anything from speaker repair to a substitute for wood glue. In the latter use, it does not provide a particularly strong bond, but often a bond that is less than full strength is sufficient. The various cements available as "plastic cement" or "general-purpose cement" (like "Duco") operate on a physical rather than chemical principle. These adhesives are especially useful when materials of different nature are glued together. Of special utility is "Pliobond" or similar rubber-based glues, which can be used to glue rubber, fabric, plastic, metal, and even glass. This does not mean that they will mend broken pieces, but rather that a strip of metal can be glued to another strip of metal (or glass, or plastic) and that the bond is fairly strong. In using this type of cement it is often necessary to apply several coats to materials that have a rough and porous surface before the final gluing is done. Actually, the principle of lubrication is simply to "float" the moving part on the lubricant. This means that the lubricant is placed between two or more surfaces subjected to wear and, because the lubricant is essentially liquid, friction between the two solid pieces is minimized. This principle works as well in a shaft bearing as on a contact wiper arm. From it we see at once that, where electrical contacts are lubricated, the lubricant should be electrically conducting. We also see that the viscosity, or "degree of flowing" of the lubricant, is important, because it will determine just how well a particular moving part can "float" in the lubricant. Light machine oil, for example, may be good for a shaft that turns rapidly in a sleeve bearing such as in an electric drill or saw, but, when used on a TV tuner shaft, the oil may simply run out and leave the bearing dry. Still another consideration in choosing .a lubricant is its temperature stability. Vaseline or petroleum jelly is an excellent lubricant for many wearing surfaces, but, in most electronic devices, the operating temperature is so high that Vaseline melts and loses its ability to "float" the moving part. Butter and lard are also excellent lubricants, but they melt and have the further drawback that they become rancid and deteriorate in a short time. All applications of lubricants in electronic equipment can be divided into those where purely mechanical action is involved and those in which an electrical function must also be considered. In that latter category fall such applications as those involving grounding springs, wiper arms, moving contacts in potentiometers, and all other places where electrical currents pass from a moving member to a stationary one. For all electrical lubricating problems of this type the lubricant should be electrically conductive in addition to meeting other requirements. Typical of electrically conducting lubricants is graphite, which is available under such trade names as "Grafoline" and "Graphlube." This material is very good for larger power switches and power relays, since it has the ability to reduce arcing and thereby greatly prolong the life of the contacts. Another specially good lubricant for electrical contacts is "Lubriplate," made by Walsco or "Lube-rex," made by General Cement. These are pastes that have the right viscosity, electrical properties and temperature stability for use on the contacts of tuners and wafer switches. They tend to spread a film all over the contact area. After a relatively long period, these lubricants will turn black because of the silver oxides and the airborne dirt that they inevitably collect. Then they must be cleaned off and applied fresh. Among the electrical types of lubricant we must also mention those that are part of the so-called contact-cleaner preparations. These materials have been discussed in the previous article because they are essentially part of the cleaner. The lubricant included in such a cleaner is responsible for the thin, residual film that forms after the cleaning agent has evaporated. In choosing the right lubricant for mechanical parts, viscosity, temperature stability, and possible chemical reactions are the usual considerations. "Lubriplate" or any of the other preparations already mentioned can be used in some applications where motion is not rapid or continuous, such as for the fine-tuning shaft in a TV tuner or on the idler pulley of a tuning-dial mechanism. For the moving parts of phonographs or tape recorders or the gearing of antenna rotators, different lubricants are recommended. General Cement offers a grease called "StaPut," which maintains constant viscosity over a wide temperature range. It is thus especially recommended for phonographs and the moving parts of tape recorders. 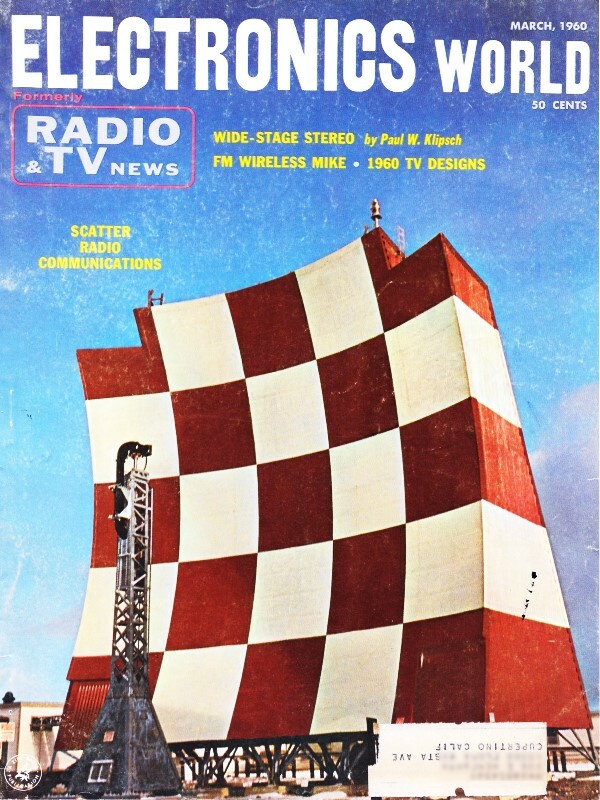 A good grade of automobile grease can be used for most antenna rotators and for the gearing of power TV tuners. One of the really handy lubricants for all non-electrical use is Dow-Corning's DC-4 silicone grease. This material remains unaffected by most chemicals, is stable over a very wide temperature range, and lubricates equally well for plastics and all types of metals. It also serves as insulation on terminals exposed to the weather. When lubricating any piece of machinery, the old lubricant should be thoroughly cleaned off before the new one is applied. Almost all lubricants can be dissolved by either alcohol, carbon tetrachloride, or benzene. Silicon greases, an exception to this rule, require special solvents. In addition to the most frequently used types of chemicals (cleaners, solvents, cements, or lubricants) the electronics parts jobbers also offer a few "special" chemicals that are required less frequently but are nonetheless useful. Into this group fall the enamel-wire stripping liquids, materials to prevent dial-cord slipping, silver pastes for preparing printed wiring, and other compounds. Enamel-wire stripping liquids will be particularly useful to the technician who winds his own coils. Silver paste is not an essential in ordinary service work, since broken conductors on printed-wiring boards usually can be bridged with solder and wire, but a non-slip compound is very handy. Wrinkle-finish enamel, label cement, color-coding enamels, and porcelain glaze are all chemicals that are more likely to be found on the experimenter's bench than in the average service shop. A variety of plastic cements, each intended to hold specific plastics together, has been discussed. 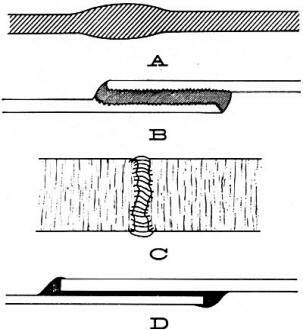 General-purpose types of cements and their mechanical-adhesion principles were described in some detail. From this we see that some thought is required before we can select and apply cement properly. Lubrication of electrical contacts and of mechanical parts requires different lubricants with different characteristics. Knowing the job that is to be done and what various preparations can do is essential in selecting the best "electronic chemical" from the jobber's shelf for anyone of the many uses that come up.